Chef Paul Shufelt of Workshop Eatery used his latest column in the Edmonton Sun last week to discuss the challenges faced by cooks trying to make a respectable wage: “Our system is broken, those that tell you otherwise are lying. Sadly though, until we all agree to change the way we do business…talented young cooks will continue to give up, in pursuit of something a little more financially rewarding.” He was also interviewed on Global Edmonton about his thoughts on chef compensation. A new bubble tea chain from China called Heeretea has opened in Old Strathcona, at 11116 82 Avenue. A location of the chain Delicious Pho is now open in the MNP Tower (101 Street & 102 Avenue). The Raymond Block at Whyte Avenue and 105 Street will soon house a Blaze Pizza and Five Guys, but another location of Remedy Cafe will open on February 2, 2019. The location will include a chai brewery. More of a re-opening – Austrian restaurant The Bauernschmaus is open again after a renovation. La Poutine Week is returning on February 1-7, 2019, providing an opportunity for participating restaurants to showcase a signature poutine. While it claims to be a national event, representation throughout Canada is spotty, with Winnipeg actually claiming the quantitative crown. Are you interested in opening a microbrewery? The City of Edmonton is hosting a free information session on February 12, 2019 that will include reps from AGLC. NAIT is hosting a Junior Chefs’ Valentine’s Dinner on February 12, 2019. Tickets for the 3-course meal are $65. Motley Que Barbeque is hosting an Introduction to BBQ class on March 10, 2019. Tickets start at $110. Hot Chefs Cool Beats is returning after a hiatus. It will take place on April 25, 2019 at the Mosaic Centre. Early bird tickets are priced at $125 and are available until February 1, 2019. I attended the inaugural event back in 2012. Leduc and Stephanie previewed Gangnam Street Food. Graham is the latest to rave about Partake. The Journal reviewed Noorish, which revamped both its menu and decor. Crystal shared her experience of the Omakase meal at Japonais, and of the revamped happy hour menu at Joey’s. Mojojojo Pickles, a mainstay at local farmers’ markets, will have one final hurrah at the Old Strathcona Farmers’ Market next week. Thankfully, their products are stocked at many local businesses, so you’ll still be able to get your briny fix! David Staples profiled serial restaurant entrepreneur Tatsuo Asai, who most recently opened Tokiwa Ramen. Western Living says that “Edmonton’s food scene is killing it right now”. Did you know there is a so-called “fourth wave” of coffee? Edmonton Made makes the case that some local cafes fall into this category. Sharman recapped the recent Prairie on a Plate dinner at Under the High Wheel. Linda highlighted ten Vietnamese entrepreneurs in Edmonton, including the owners behind An Chay, Pho Boy, and XO Bistro + Bar. There’s a new app available called Tomati that provides information on restaurant health inspection reports. The Silver Skate Festival, running February 8-18, 2019, is looking for more food vendors. Applications are due January 25, 2019. I had to hit up at least one Chinatown Dining Week restaurant this weekend! Su and I met up at Fuqing Lanzhou Noodles on Friday, and found it to be a full house by the time we left! 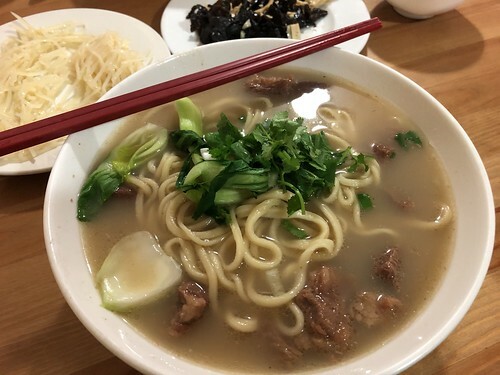 We really enjoyed their hand-pulled noodles, nestled among the beef cubes and broth. Chinatown Dining Week runs until January 27, 2019.